Home > Variable and Multi-Speed Belts > MULTI-SPEED BELTS > 2430V388 Multi-Speed Belt, Industrial Grade. 2430V388 Multi-Speed Belt, Industrial Grade. 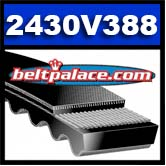 2430V388 Multi-Speed Belt. Industrial Grade. Length 39.5” O.C - Top width 1.5" - Angle 30. **Stock may be limited. Please call for availability! VARIABLE SPEED Bando Power Max 2430V388 (*non-standard size). GATES, BANDO, BROWNING, JASON, SPEED CONTROL 2430V388 Belt.